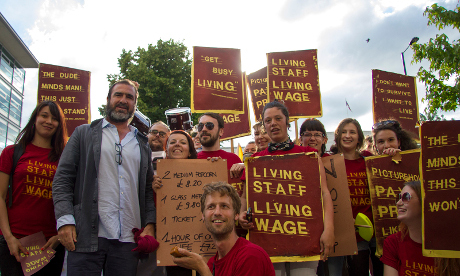 Cinema staff striking over pay moved their picket line from the iconic Ritzy theatre in Brixton to Hackney Picturehouse on Saturday and received a show of support from footballing superstar and actor Eric Cantona. The Ritzy Living Wage campaign is calling on the Picturehouse cinema chain – owned by screen giant Cineworld – to up staff wages from £7.24 per hour to the London Living Wage (LLW) of £8.80 per hour. Carrying placards and with a samba band in tow, a group of around 30 protesters created a “carnival atmosphere” outside the Mare Street cinema. Former Manchester United player ‘King’ Eric Cantona, in Hackney for a Q&A session on his new documentary for Amnesty International’s football film festival, was drawn outside by the sound of his old club’s famous chant “Ooh Ah Cantona”. 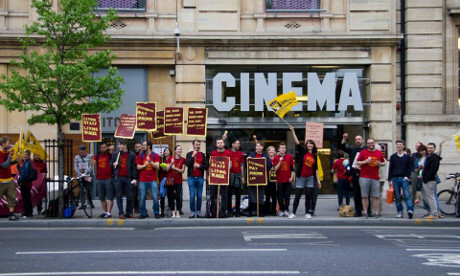 Saturday’s strike was the sixth to be staged in the ongoing dispute by workers at the unionised Ritzy cinema. Talks broke down between management and BECTU (the media and entertainment union) last week, prompting the union to call for a national boycott of Picturehouse cinemas. Ritzy union representative Rob Lugg told the Hackney Citizen that implementing the London Living Wage is “fundamentally important”, especially for a company that host events by organisations such as Amnesty International. “We have always tried to be a fair employer and pay fair rates; we are one of the highest paying employers in Brixton and in the cinema industry. We are completely sympathetic to the difficulties of living in London with the ongoing property and cost of living crisis. The London Living Wage, which is set independently and updated annually, recommends businesses to pay London workers £8.80 per hour and is calculated according to the basic cost of living in the capital.